Las V egas, NV — Sports AND Entertainment Capital of the World? We’ll take it! Las Vegas is definitely going through a major sports transformation. The Golden Knights just wrapped up an epic first season, the Raiders are slated to play their first game here in 2020, and the 51s, a Triple-A affiliate of the New York Mets is building a new stadium in Summerlin. In addition, Las Vegas is now home to a professional soccer team – The Lights FC, and a WNBA team – The Las Vegas Aces. 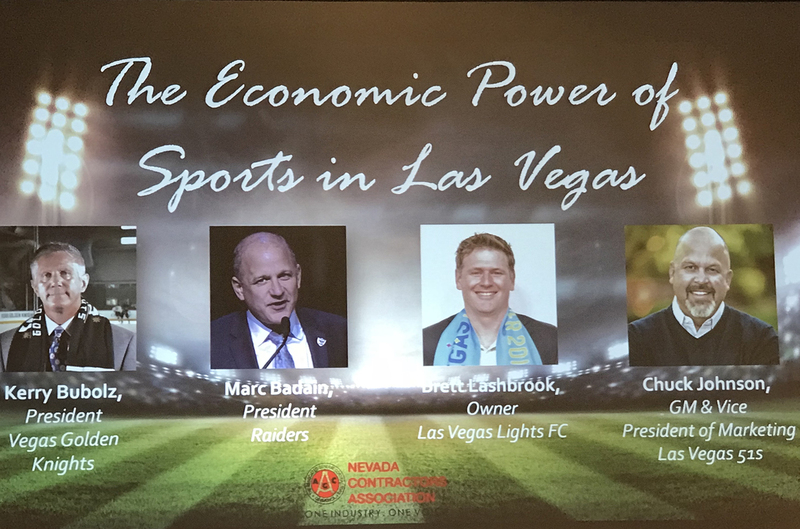 Recently TERP got the inside scoop at the Nevada Contractor’s Luncheon from a powerhouse sports panel that included Kerry Bubolz; President of Vegas Golden Knights, Marc Badain; President of Raiders, Brett Lashbrook; Owner of Las Vegas Lights FC, and Chuck Johnson; GM & Vice President of Marketing for Las Vegas 51s. Everyone on the panel is excited about the future of sports in Las Vegas, and believes the ripple effect these teams are having on the city’s economy is nothing short of amazing.